At a startup marathon event this past weekend in Frisco, several businesses were born. On day one, participants began pitching their ideas while absorbing concepts from others. Next, the group votes to pick the strongest concepts and then forms teams to develop them. Teams worked Friday, Saturday and all morning Sunday, finishing that night with the final pitches, from which a panel of judges selected the winners. “We had 15 people pitch ideas on Friday night, six teams formed and hopefully we’ll have six businesses or nonprofits continue on,” Kemp said. The Startup Weekend concept was created in 2007 by Andrew Hyde and was first held in Boulder. The model gained worldwide popularity and in January 2010 Marc Nager and Clint Nelsen took over ownership and registered the organization as a nonprofit. “Our event was part of the Global Startup Battle this year, which means Summit County teams are competing against teams around the globe in the largest startup competition in the world,” Kemp said. First place honors went to a new travel-related app called Native X, an itinerary-planning app using artificial intelligence. The creative team included Brenden Coleman, Bonnie Spalding and Patrick Mackintosh. The second-place finisher, which also won crowd favorite, was Elite Altitude Performance. The business will offer high-altitude triathlon and cycling training camps led by elite athletes Nadiya Mitelman and Nick Frey. 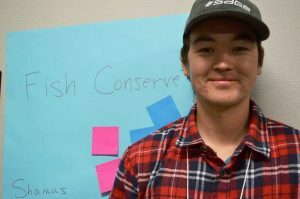 Fish Conserve, a program that uses crowd-sourced data for fish and river conservation, took third place. The idea was the brainchild of Shamus Lahman who partnered with Katherine Roth to flesh out the concept. All three teams are entered into the Global Startup Battle and will compete with other newly launched startups and businesses around the world. Although Lahman said he walked into the Friday pitch session with only an idea, by taking part in the weekend he left with a business plan ready to launch. “The best thing that happened is I got a team together,” he said. The concept married Lahman’s love of fishing with his skills as a web developer, but he admitted his partner helped round out the equation. “She is really good at working with nonprofits and helping write grant requests,” he explained. As the only nonprofit venture of the event, Lahman explained the first step would involve sourcing local, state, national and corporate grants to help raise capital. So far the partners have identified about $50,000 from various sources they hope to apply for to begin the venture. Admitting he would be lost trying to navigate the nonprofit grant world alone, Lahman said the networking potential at a startup weekend event is invaluable. “You need an open mind,” he said. “Try to figure out where you can help with the business process and what kinds of strengths you bring,” he advised. In Lahman’s case, he said having a vision was useful. Natiya Mitelman, who said her idea had been floating around for a year prior to the weekend, also stressed the importance of the event’s networking opportunities. Over the course of the three-day event, Mitelman met potential investors and three clients for the all-inclusive cycling and triathlon camps. Long hours were the norm over the three-day event. “During the weekend, everyday I stayed and worked with a team past midnight, and started at 8 the next morning,” Mitelman said. Larry Sullivan, lead organizer for Summit County Startup Weekend, said what is accomplished in a short time must be seen to believed. Aaron Landau, founder of Evo3 Workspace, noted that nationally only 12 percent of teams would continue their business plan after the event.